They should have called it something other than Tenchi Muyo. This seems to have nothing to do with the original, and Masaki Kajishima is not involved at all. EDIT: Ok I'll watch it and be happy about it. Yeah. This is a big WTFness right here. Though since hearing that they're basically 5 minute ads for the area, I never expected say, an OVA continuation. But besides Kajishima not being directly involved (not even the art), and we have two new characters besides Tenchi, I'm in agreement. Why even make it Tenchi? I don't mind new characters in, even a non-canon spinoff. But we're talking 5 minute episodes here. Not a lot of time for character development. 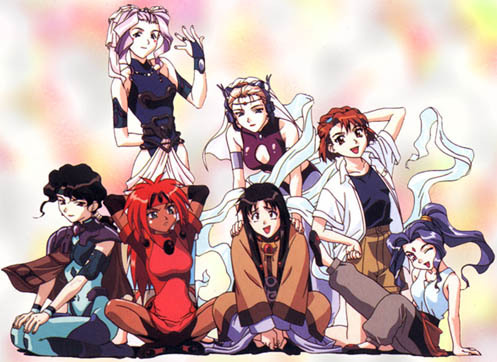 Definitely not Tenchi art, looks like a lot of the stuff you see nowadays. Though I expected some extreme changes. Though the community working on this still got kudos since they actually had the balls to do something about it and make their own fanfiction legit. What a tragedy.... But I guess I should not be surprised, coming from a company that was bought out by pachinko owners [yakuza]. The real losers here are the townsmen of Takahashi, as they're not going to see an increase in tourism from a five minute series that has nothing more to do with Tenchi than it's opening title. AIC took their money and pulled a real fast one. This isn't a proper 20th anniversary series for the Tenchi franchise - it's a piece of turd that must be killed with fire several times and then sent to the seventh layer of Hell, that's what it is. I hope Kajishima gives us the announcement of a fourth OVA series or a continuation of Isekai at Comiket 86, because at this point either or would be about the only thing that can save the franchise now in my book. In short... I'm not even going near this series with a nine and a half foot pole. It's Tenchi in name only and, given the fact that this is an anniversary year for the franchise, that absolutely reeks of laziness or not caring about the fans, or worse (Both). Every other company with a major anime that was celebrating an anniversary recently didn't make the mistake that was made here. I think the best thing to do here is take it for what it is and forget it's Tenchi for a second it might actually be enjoyable, We shall see though. The Yakuza are behind this? That explains a lot... "Good luck" with all the planned merchandising and tourism for that horribly generic turd. I have waited 10 years for a continuation of my favourite series and get THIS?! Tenchi Universe, Tenchi In Tokyo, Nabeshin in GXP, and now the final blow. Why do almost everybody involved have to do their utmost to destroy something that was originally absolutely wonderful? Time to burn all my Tenchi stuff in effigy. This weekend, I think I will be watching Tenchi Universe and Tenchi In Tokyo. They both have to be better than this crap. That look like they have a project that had nothing to do with Tenchi Muyo and they decide to make it part of the Tenchi Muyo franchise just so people would watch this. I would still watch that but I am disappointed I wouldn't see Aeka, Sasami, Washu and Mihoshi again. +1 to you good sir. That theory might actually be closer to the truth than we realize right now. The Yakuza are behind this? Yes and no? A couple years back AIC was bought by a pachinko company and after being used as an excuse to write-off all their financial losses, was "sold" back at about 10% of what they originally paid for it. While owned by the "pachinko company" they produced such trash like season two of Oreimo.